We offer the solution with our 6155 Flexible Curtain Track Drop Ceiling Clamp that can attach to the drop panel grid support and to a curtain track without any drilling or bracing. These clamps work with our 6100 Flexible Curtain Track, a white, lightweight, PVC, I-beam configuration track that is custom cut, and can be bent by hand without compromising strength. This track can be used for straight, curved and angled applications and is one of most popular tracks. Next on the list to complete this system are our 6111 Flexible Curtain Track Carriers and 6131 Flexible Curtain Track End Caps. The flexible track drapery hardware with clamps is the perfect fit for almost all curtain needs with a drop ceiling. This system can be used in hospitals or clinics with our Sundance Antimicrobial Curtains, and is particularly good for this application given that the track can be bent as needed around a bed or exam area. There are many uses at home as well; finished basements create many opportunities for putting this system to good use. 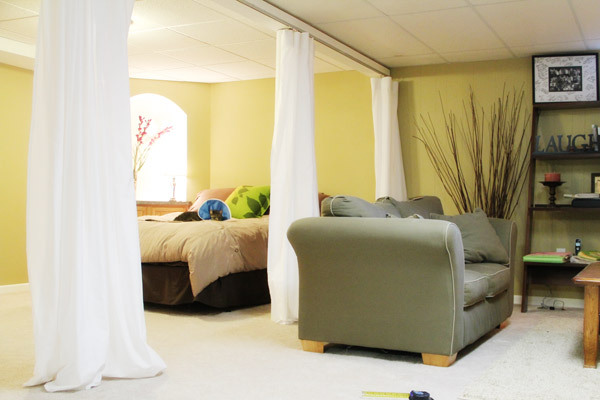 You can add some warmth and texture to your basement play room or man cave, or create a virtual wall to hide a storage area, sump pump, or those piles of laundry you haven’t gotten to yet. And how about the really radical idea of using the curtains to cover the windows? The windows in a basement with a drop ceiling may be at the level of the ceiling panels, making hanging a rod impractical. Install our track and your favorite decorative curtains, and you are set. You can order any of these items on our website or simply contact us!